As mentioned in Part I, Robert’s father, Donald Duncan, founded Duncan Aviation in 1956 and this year, Duncan Aviation celebrates 60 years. Now read the rest of the story of how Robert’s vision transitioned the small, family business from its modest beginnings into a company with a respected presence around the world. Don Fiedler, now Manager of New Business Development for Components, joined the 10-year-old company in 1966 as the fourth member of the very new avionics team. The team repaired and installed avionics equipment on Bonanzas, Barons, and King Airs, and they also did some work on Harry’s helicopters. As the industry started shifting from primarily piston engines to turbines, Robert saw the surplus parts for the older prop planes just sitting on shelves, and he surmised that there were probably FBOs around the country that had similar investments in unmoving parts. He envisioned a program where companies would send Duncan Aviation their surplus parts and, based on very new, barely known computer networking—a precursor of today’s Internet—Duncan Aviation would create an inventory of the parts and sell them on consignment. This vision became AVPAC (Parts & Rotables today) in the early 1980s. Don Fiedler explains that Robert’s vision was to establish a network, collect the parts, set fair prices, and ship them out to buyers the day they ordered. Robert met with Bob McCammon (now manager of Aircraft Sales), Bob Tooker (Senior Sales Rep/Quality Control for Parts & Rotables Sales), Larry Stewart (former Senior Rotables Manager who retired in January after 43 years with Duncan Aviation), and Don Fiedler and explained his idea to get Duncan Aviation into the parts consignment business. Once AVPAC was up and running, Robert again approached Don with an idea. This time, Robert told Rick Whitesell and Don of an experience he and his wife Karen had at a Lincoln’s Hovland-Swanson department store. 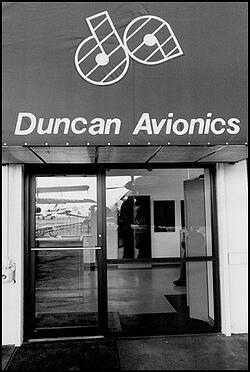 One of Duncan Aviation’s greatest assets has always been its employees. Robert knew there were talented, experienced, knowledgeable technicians in Lincoln, hundreds if not thousands of miles away from where the avionics were that needed servicing. As a result of Robert’s “five-minute idea,” Duncan Aviation now has more than 20 avionics satellite shops located at busy airports around the country. Not only do our customers drop into these facilities for quick repairs, but also they can schedule complex installations, including upgrades to avionics that satisfy the NextGen mandates. Robert credits Don for the success of the program. “It was my concept, but Don ran with it, and now Matt is managing all of them,” says Robert. Matt is Matt Nelson, Manager of Satellite Operations. He started at Duncan Aviation in 1987 when he was 18 years old, and it was his first full-time job. 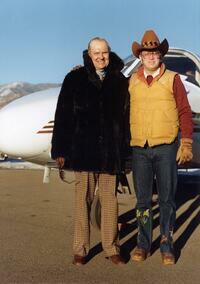 As someone who has worked at Duncan Aviation for 29 years, Matt is a member of an exclusive club called Silver Wings. Silver Wings is a club that Robert created to celebrate employees who have worked at Duncan Aviation for 25 years or more. Because silver commemorates a 25th anniversary, the group that worked with Robert to establish the club chose Silver Wings as its name. Todd Duncan, too, is a member of the Silver Wings club, as he has been working at Duncan Aviation for 28 years. Todd has been Chairman of Duncan Aviation since 2007, and he’s seen the company ride the waves, the highs and lows, of the business aviation industry. Todd agrees with what Robert calls the immeasurable value of the employees at Duncan Aviation. 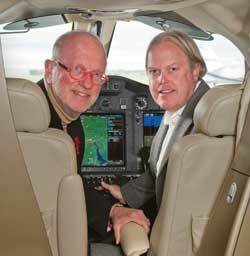 Father and son are keenly aware of the network of support they have created and developed at Duncan Aviation. 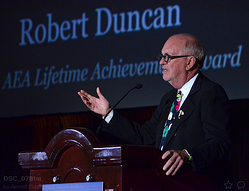 Yesterday, at the annual AEA convention in Orlando, Florida, Robert was given a life-time achievement award, recognizing his contributions to the aviation industry and acknowledging everything he’s done at Duncan Aviation in the last 60 years.